The day has finally come. To cap off this week, one of the super trendy streaming apps has finally hit Android in the form of a beta, Meerkat. 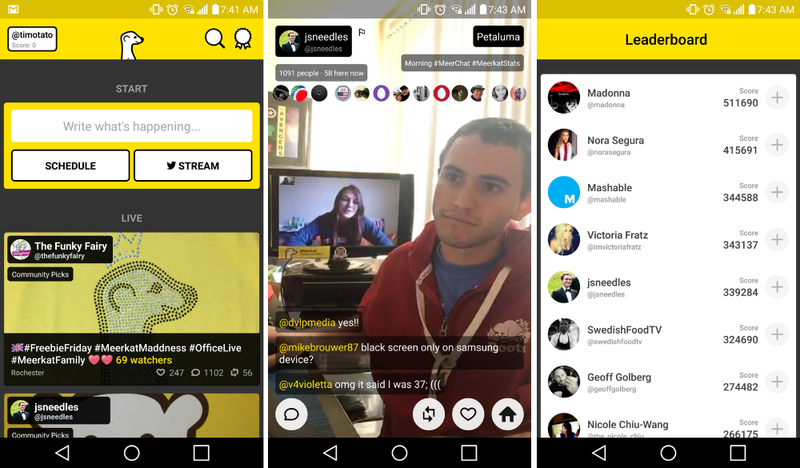 Meerkat is the app that launched ahead of Twitter’s own Periscope, which allows users to stream feeds of video while linked to your Twitter account. Both apps have seen great success on iOS, and thankfully, Android folk can now join in on the fun. Once you have Meerkat booted up and logged into your Twitter account, you can view streams from other individuals, host your own little stream for people to watch, and also check out the top users of Meerkat view a leaderboard. As of this morning, Madonna is the top Meerkat users. Awesome. Now, before you head on over to Google Play, note that the rating for Meerkat (beta) is currently overwhelmed by 1 star reviews. People say it doesn’t work, crashing and just not loading. However, I tried it on the LG G4 and it seems to work fine. Hopefully your experience can be positive, too. Download it, then let us know what you think.